It's (again) been a little while, and much has been happening. Two major themes today; sewing and running. But since this is the knit and run blog I should probably fill in an update about what's on the needles. I've got a Lichen and Moss scarf that's gone into hibernation now that I'm confident I won't need it any time soon (well, as confident as I can be with British summer weather). There's a Liala that gave me a bit of a mental block before I worked out there was an error in the instructions - and being crochet and therefore not my most experienced yarny craft it took me a while to accept that I was indeed right and the pattern wrong. But this has also given way to the latest project; an Echo Flowers Shawl in a beautiful maroon colour (technically 'Loganberry') for a friend's wedding present. As for sewing, my little brain is full of plans. Myself and the fiancé were out touristing this week (hooray annual leave!) and dropped into Foyles…where I bought a lovely little book called The Secrets of Sewing Lingerie. Instantly wanted to make it all. Started fairly simple and wanting something to celebrate our 3 year anniversary I made the 'Boudoir Blushes' camisole and french knickers. And I'm pretty darn pleased with how they turned out. Obviously french seamed throughout, they're trimmed in a little sort of tulle-y lace. The fabric itself is a slinky and slippy polyester with a beautiful paisley pattern, and I surprised myself with how well I managed to work with it. The pattern was lovely and simple. Unfortunately I ran out of trim (despite ordering an extra half metre) so ended up trimming the top of the shorts rather than the legs. But I think I maybe prefer it that way anyway. The top is actually a little big for me - the darts aren't quite in the right place - but it was only ever meant to be a wearable muslin anyway and for nightwear it doesn't make much of a difference. I'm chuffed with the little set. As for the running things have been going well. I've managed to hit a PB at parkrun two weeks in a row (WHOOP!) and suddenly find myself eyeing up a sub-25 for the first time. The Endure 24hr relay is looming large next weekend and the week after that is the Nike 10km. I was really determined to get into it this year after having to watch all the snazzy photos and build up to last year's We Run the Night. So I was speedy to sign up, and equally speedy to pick up the race pack. It's got a snazzy race tank, and came in it's own little bag. There's a colour coded wristband for starting wave, a medical bracelet, and a guest pass wristband for the fiancé, as well as the race number shoe tag. The fact there's no bib number makes me suspect that individual photos may not be a feature. Finally, it's been 3 years since my lovely fiancé first became my lovely boyfriend. It feels much longer, in a good way. Being in Covent Garden to pick up my race pack at Nike Town meant we had a chance to go to our favourite anniversary restaurant - Belgo. 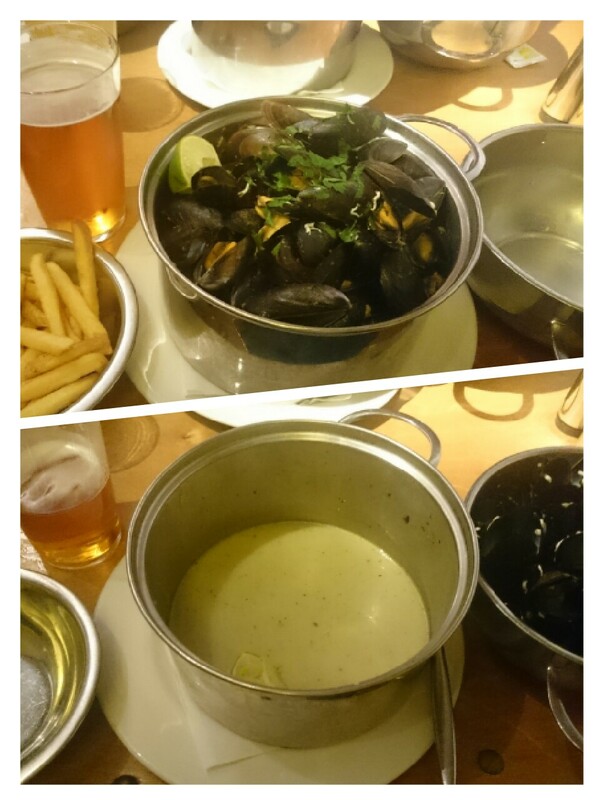 Mussels, chips and beer. Perfect. We've also tentatively started making wedding things..! There are going to have to be quite a few paper flowers made between now and the big day, but everything has to start somewhere. So it's been an exciting few days recently. I can't wait to see where the next 3 years will take us.